This article is about any type of electromagnetic radiation from an object related to its temperature. For infrared light, see Infrared. "Heat radiation" redirects here. It is not to be confused with Heat-Ray (disambiguation). 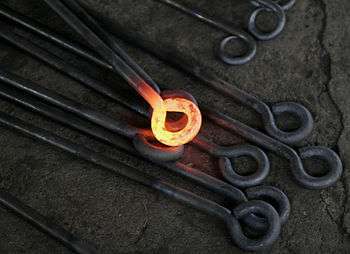 Thermal radiation in visible light can be seen on this hot metalwork. Its emission in the infrared is invisible to the human eye and the camera the image was taken with, but an infrared camera could show it (See Thermography). Thermal radiation is electromagnetic radiation generated by the thermal motion of charged particles in matter. All matter with a temperature greater than absolute zero emits thermal radiation. When the temperature of a body is greater than absolute zero, inter-atomic collisions cause the kinetic energy of the atoms or molecules to change. This results in charge-acceleration and/or dipole oscillation which produces electromagnetic radiation, and the wide spectrum of radiation reflects the wide spectrum of energies and accelerations that occur even at a single temperature. Examples of thermal radiation include the visible light and infrared light emitted by an incandescent light bulb, the infrared radiation emitted by animals is detectable with an infrared camera, and the cosmic microwave background radiation. Thermal radiation is different from thermal convection and thermal conduction—a person near a raging bonfire feels radiant heating from the fire, even if the surrounding air is very cold. Sunlight is part of thermal radiation generated by the hot plasma of the Sun. The Earth also emits thermal radiation, but at a much lower intensity and different spectral distribution (infrared rather than visible) because it is cooler. The Earth's absorption of solar radiation, followed by its outgoing thermal radiation are the two most important processes that determine the temperature and climate of the Earth. If a radiation-emitting object meets the physical characteristics of a black body in thermodynamic equilibrium, the radiation is called blackbody radiation. Planck's law describes the spectrum of blackbody radiation, which depends only on the object's temperature. Wien's displacement law determines the most likely frequency of the emitted radiation, and the Stefan–Boltzmann law gives the radiant intensity. Thermal radiation is one of the fundamental mechanisms of heat transfer. Thermal radiation is the emission of electromagnetic waves from all matter that has a temperature greater than absolute zero. It represents a conversion of thermal energy into electromagnetic energy. Thermal energy consists of the kinetic energy of random movements of atoms and molecules in matter. All matter with a temperature by definition is composed of particles which have kinetic energy, and which interact with each other. These atoms and molecules are composed of charged particles, i.e., protons and electrons, and kinetic interactions among matter particles result in charge-acceleration and dipole-oscillation. This results in the electrodynamic generation of coupled electric and magnetic fields, resulting in the emission of photons, radiating energy away from the body through its surface boundary. Electromagnetic radiation, including light, does not require the presence of matter to propagate and travels in the vacuum of space infinitely far if unobstructed. The characteristics of thermal radiation depend on various properties of the surface it is emanating from, including its temperature, its spectral absorptivity and spectral emissive power, as expressed by Kirchhoff's law. The radiation is not monochromatic, i.e., it does not consist of just a single frequency, but comprises a continuous dispersion of photon energies, its characteristic spectrum. If the radiating body and its surface are in thermodynamic equilibrium and the surface has perfect absorptivity at all wavelengths, it is characterized as a black body. A black body is also a perfect emitter. The radiation of such perfect emitters is called black-body radiation. The ratio of any body's emission relative to that of a black body is the body's emissivity, so that a black body has an emissivity of unity. Absorptivity, reflectivity, and emissivity of all bodies are dependent on the wavelength of the radiation. The temperature determines the wavelength distribution of the electromagnetic radiation. For example, fresh snow, which is highly reflective to visible light (reflectivity about 0.90), appears white due to reflecting sunlight with a peak wavelength of about 0.5 micrometers. Its emissivity at a temperature of about −5 °C (23 °F), peak wavelength of about 12 micrometers, is 0.99. The distribution of power that a black body emits with varying frequency is described by Planck's law. At any given temperature, there is a frequency fmax at which the power emitted is a maximum. Wien's displacement law, and the fact that the frequency is inversely proportional to the wavelength, indicates that the peak frequency fmax is proportional to the absolute temperature T of the black body. The photosphere of the sun, at a temperature of approximately 6000 K, emits radiation principally in the (humanly) visible portion of the electromagnetic spectrum. Earth's atmosphere is partly transparent to visible light, and the light reaching the surface is absorbed or reflected. Earth's surface emits the absorbed radiation, approximating the behavior of a black body at 300 K with spectral peak at fmax. At these lower frequencies, the atmosphere is largely opaque and radiation from Earth's surface is absorbed or scattered by the atmosphere. Though some radiation escapes into space, most is absorbed and then re-emitted by atmospheric gases. It is this spectral selectivity of the atmosphere that is responsible for the planetary greenhouse effect, contributing to global warming and climate change in general (but also critically contributing to climate stability when the composition and properties of the atmosphere are not changing). The incandescent light bulb has a spectrum overlapping the black body spectra of the sun and the earth. Some of the photons emitted by a tungsten light bulb filament at 3000 K are in the visible spectrum. Most of the energy is associated with photons of longer wavelengths; these do not help a person see, but still transfer heat to the environment, as can be deduced empirically by observing an incandescent light bulb. Whenever EM radiation is emitted and then absorbed, heat is transferred. This principle is used in microwave ovens, laser cutting, and RF hair removal. Unlike conductive and convective forms of heat transfer, thermal radiation can be concentrated in a tiny spot by using reflecting mirrors. Concentrating solar power takes advantage of this fact. In many such systems, mirrors are employed to concentrate sunlight into a smaller area. Instead of mirrors, Fresnel lenses can also be used to concentrate heat flux. (In principle, any kind of lens can be used, but only the Fresnel lens design is practical for very large lenses.) Either method can be used to quickly vaporize water into steam using sunlight. For example, the sunlight reflected from mirrors heats the PS10 Solar Power Plant, and during the day it can heat water to 285 °C (558.15 K) or 545 °F. Lighter colors and also whites and metallic substances absorb less illuminating light, and thus heat up less; but otherwise color makes small difference as regards heat transfer between an object at everyday temperatures and its surroundings, since the dominant emitted wavelengths are nowhere near the visible spectrum, but rather in the far infrared. 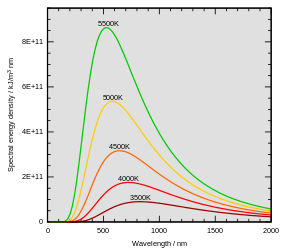 Emissivities at those wavelengths have little to do with visual emissivities (visible colors); in the far infra-red, most objects have high emissivities. Thus, except in sunlight, the color of clothing makes little difference as regards warmth; likewise, paint color of houses makes little difference to warmth except when the painted part is sunlit. The main exception to this is shiny metal surfaces, which have low emissivities both in the visible wavelengths and in the far infrared. Such surfaces can be used to reduce heat transfer in both directions; an example of this is the multi-layer insulation used to insulate spacecraft. Low-emissivity windows in houses are a more complicated technology, since they must have low emissivity at thermal wavelengths while remaining transparent to visible light. Nanostructures with spectrally selective thermal emittance properties offer numerous technological applications for energy generation and efficiency, e.g., for cooling photovoltaic cells and buildings. These applications require high emittance in the frequency range corresponding to the atmospheric transparency window in 8 to 13 micron wavelength range. A selective emitter radiating strongly in this range is thus exposed to the clear sky, enabling the use of the outer space as a very low temperature heat sink. Personalized cooling technology is another example of an application where optical spectral selectivity can be beneficial. 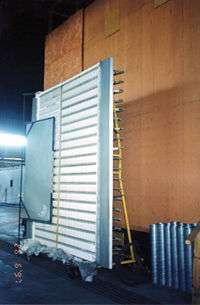 Conventional personal cooling is typically achieved through heat conduction and convection. However, the human body is a very efficient emitter of IR radiation, which provides additional cooling mechanism. Most conventional fabrics are opaque to IR radiation and block thermal emission from the body to the environment. Fabrics for personalized cooling applications have been proposed that enable IR transmission to directly pass through clothing, while being opaque at visible wavelengths. Fabrics that are transparent in the infrared can radiate body heat at rates that will significantly reduce the burden on power-hungry air-conditioning systems. Thermal radiation emitted by a body at any temperature consists of a wide range of frequencies. The frequency distribution is given by Planck's law of black-body radiation for an idealized emitter as shown in the diagram at top. The dominant frequency (or color) range of the emitted radiation shifts to higher frequencies as the temperature of the emitter increases. For example, a red hot object radiates mainly in the long wavelengths (red and orange) of the visible band. If it is heated further, it also begins to emit discernible amounts of green and blue light, and the spread of frequencies in the entire visible range cause it to appear white to the human eye; it is white hot. Even at a white-hot temperature of 2000 K, 99% of the energy of the radiation is still in the infrared. This is determined by Wien's displacement law. In the diagram the peak value for each curve moves to the left as the temperature increases. The total amount of radiation of all frequencies increases steeply as the temperature rises; it grows as T4, where T is the absolute temperature of the body. An object at the temperature of a kitchen oven, about twice the room temperature on the absolute temperature scale (600 K vs. 300 K) radiates 16 times as much power per unit area. An object at the temperature of the filament in an incandescent light bulb—roughly 3000 K, or 10 times room temperature—radiates 10,000 times as much energy per unit area. 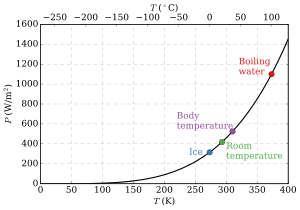 The total radiative intensity of a black body rises as the fourth power of the absolute temperature, as expressed by the Stefan–Boltzmann law. In the plot, the area under each curve grows rapidly as the temperature increases. The rate of electromagnetic radiation emitted at a given frequency is proportional to the amount of absorption that it would experience by the source. Thus, a surface that absorbs more red light thermally radiates more red light. This principle applies to all properties of the wave, including wavelength (color), direction, polarization, and even coherence, so that it is quite possible to have thermal radiation which is polarized, coherent, and directional, though polarized and coherent forms are fairly rare in nature far from sources (in terms of wavelength). See section below for more on this qualification. The general properties of thermal radiation as described by the Planck’s law apply if the linear dimension of all parts considered, as well as radii of curvature of all surfaces are large compared with the wavelength of the ray considered’ (typically from 8-25 micrometres for the emitter at 300 K). Indeed, thermal radiation as discussed above takes only radiating waves (far-field, or electromagnetic radiation) into account. A more sophisticated framework involving electromagnetic theory must be used for smaller distances from the thermal source or surface (near-field thermal radiation). For example, although far-field thermal radiation at distances from surfaces of more than one wavelength is generally not coherent to any extent, near-field thermal radiation (i.e., radiation at distances of a fraction of various radiation wavelengths) may exhibit a degree of both temporal and spatial coherence. Planck’s law of thermal radiation has been challenged in recent decades by predictions and successful demonstrations of the radiative heat transfer between objects separated by nanoscale gaps that deviate significantly from the law predictions. This deviation is especially strong (up to several orders in magnitude) when the emitter and absorber support surface polariton modes that can couple through the gap separating cold and hot objects. However, to take advantage of the surface-polariton-mediated near-field radiative heat transfer, the two objects need to be separated by ultra-narrow gaps on the order of microns or even nanometers. This limitation significantly complicates practical device designs. Another way to modify the object thermal emission spectrum is by reducing the dimensionality of the emitter itself. This approach builds upon the concept of confining electrons in quantum wells, wires and dots, and tailors thermal emission by engineering confined photon states in two- and three-dimensional potential traps, including wells, wires, and dots. Such spatial confinement concentrates photon states and enhances thermal emission at select frequencies. To achieve the required level of photon confinement, the dimensions of the radiating objects should be on the order of or below the thermal wavelength predicted by Planck’s law. Most importantly, the emission spectrum of thermal wells, wires and dots deviates from Planck’s law predictions not only in the near field, but also in the far field, which significantly expands the range of their applications. In a practical situation and room-temperature setting, humans lose considerable energy due to thermal radiation. The energy lost by emitting infrared radiation is partially regained by absorbing the heat flow due to conduction from surrounding objects, and the remainder resulting from generated heat through metabolism. Human skin has an emissivity of very close to 1.0. Using the formulas below shows a human, having roughly 2 square meter in surface area, and a temperature of about 307 K, continuously radiates approximately 1000 watts. If people are indoors, surrounded by surfaces at 296 K, they receive back about 900 watts from the wall, ceiling, and other surroundings, so the net loss is only about 100 watts. These heat transfer estimates are highly dependent on extrinsic variables, such as wearing clothes, i.e. decreasing total thermal circuit conductivity, therefore reducing total output heat flux. Only truly gray systems (relative equivalent emissivity/absorptivity and no directional transmissivity dependence in all control volume bodies considered) can achieve reasonable steady-state heat flux estimates through the Stefan-Boltzmann law. Encountering this "ideally calculable" situation is almost impossible (although common engineering procedures surrender the dependency of these unknown variables and "assume" this to be the case). Optimistically, these "gray" approximations will get close to real solutions, as most divergence from Stefan-Boltzmann solutions is very small (especially in most STP lab controlled environments). If objects appear white (reflective in the visual spectrum), they are not necessarily equally reflective (and thus non-emissive) in the thermal infrared. Most household radiators are painted white but this is sensible given that they are not hot enough to radiate any significant amount of heat, and are not designed as thermal radiators at all - they are actually convectors, and painting them matt black would make little difference to their efficacy. Acrylic and urethane based white paints have 93% blackbody radiation efficiency at room temperature (meaning the term "black body" does not always correspond to the visually perceived color of an object). These materials that do not follow the "black color = high emissivity/absorptivity" caveat will most likely have functional spectral emissivity/absorptivity dependence. Calculation of radiative heat transfer between groups of object, including a 'cavity' or 'surroundings' requires solution of a set of simultaneous equations using the radiosity method. In these calculations, the geometrical configuration of the problem is distilled to a set of numbers called view factors, which give the proportion of radiation leaving any given surface that hits another specific surface. These calculations are important in the fields of solar thermal energy, boiler and furnace design and raytraced computer graphics. A comparison of a thermal image (top) and an ordinary photograph (bottom) shows that a trash bag is transparent but glass (the man's spectacles) is opaque in long-wavelength infrared. A selective surface can be used when energy is being extracted from the sun. For instance, when a green house is made, most of the roof and walls are made out of glass. Glass is transparent in the visible (approximately 0.4 µm<λ<0.8 µm) and near-infrared wavelengths, but opaque to mid- to far-wavelength infrared (approximately λ>3 µm). Therefore, glass lets in radiation in the visible range, allowing us to be able to see through it, but does not let out radiation that is emitted from objects at or close to room temperature. This traps what we feel as heat. This is known as the greenhouse effect and can be observed by getting into a car that has been sitting in the sun. 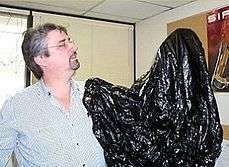 Selective surfaces can also be used on solar collectors. We can find out how much help a selective surface coating is by looking at the equilibrium temperature of a plate that is being heated through solar radiation. If the plate is receiving a solar irradiation of 1350 W/m² (minimum is 1325 W/m² on July 4 and maximum is 1418 W/m² on January 3) from the sun the temperature of the plate where the radiation leaving is equal to the radiation being received by the plate is 393 K (248 °F). If the plate has a selective surface with an emissivity of 0.9 and a cut off wavelength of 2.0 µm, the equilibrium temperature is approximately 1250 K (1790 °F). The calculations were made neglecting convective heat transfer and neglecting the solar irradiation absorbed in the clouds/atmosphere for simplicity, the theory is still the same for an actual problem. To reduce the heat transfer from a surface, such as a glass window, a clear reflective film with a low emissivity coating can be placed on the interior of the surface. “Low-emittance (low-E) coatings are microscopically thin, virtually invisible, metal or metallic oxide layers deposited on a window or skylight glazing surface primarily to reduce the U-factor by suppressing radiative heat flow”. By adding this coating we are limiting the amount of radiation that leaves the window thus increasing the amount of heat that is retained inside the window. Power emitted by a black body plotted against the temperature according to the Stefan–Boltzmann law. This formula mathematically follows from calculation of spectral distribution of energy in quantized electromagnetic field which is in complete thermal equilibrium with the radiating object. The equation is derived as an infinite sum over all possible frequencies. The energy, , of each photon is multiplied by the number of states available at that frequency, and the probability that each of those states will be occupied. where the constant of proportionality is the Stefan–Boltzmann constant and is the radiating surface area. This type of theoretical model, with frequency-independent emissivity lower than that of a perfect black body, is often known as a grey body. For frequency-dependent emissivity, the solution for the integrated power depends on the functional form of the dependence, though in general there is no simple expression for it. Practically speaking, if the emissivity of the body is roughly constant around the peak emission wavelength, the gray body model tends to work fairly well since the weight of the curve around the peak emission tends to dominate the integral. The net radiative heat transfer from one surface to another is the radiation leaving the first surface for the other minus that arriving from the second surface. where is the Stefan–Boltzmann constant and is temperature. A negative value for indicates that net radiation heat transfer is from surface 2 to surface 1.
where and are the emissivities of the surfaces. Formulas for radiative heat transfer can be derived for more particular or more elaborate physical arrangements, such as between parallel plates, concentric spheres and the internal surfaces of a cylinder. 1 2 S. Blundell, K. Blundell (2006). Concepts in Thermal Physics. Oxford University Press. p. 247. ISBN 978-0-19-856769-1. ↑ Furtak, M.; Silecky, L. (2012). "Evaluation of Onset to Second Degree Burn Energy in Arc Flash, IAEI". ↑ R. Bowling Barnes (24 May 1963). "Thermography of the Human Body Infrared-radiant energy provides new concepts and instrumentation for medical diagnosis". Science. 140 (3569): 870–877. Bibcode:1963Sci...140..870B. doi:10.1126/science.140.3569.870. PMID 13969373. Siegel, John R. Howell, Robert; Howell. John R. (November 2001). Thermal radiation heat transfer. New York: Taylor & Francis, Inc. pp. (xix – xxvi list of symbols for thermal radiation formulas). ISBN 978-1-56032-839-1. Retrieved 2009-07-23. E.M. Sparrow and R.D. Cess. Radiation Heat Transfer. Hemisphere Publishing Corporation, 1978.